It doesn’t need to be green or black tea. It doesn’t need to be tea at all. There are many reasons why I love to brew my own kombucha. I can control the sugar content, there’s more probiotic strain diversity than commercial brands, there’s no harsh synthetic carbonation, fermentation is fascinating and I’m free to experiment. Like this Cold Brew Coffee Booch. I was skeptical about fermenting coffee because it’s already acidic and I wasn’t sure if creating more acids through fermentation would enhance the flavour. But curiosity won and I’m so glad it did because I LOVE how it turned out and if you like coffee, I think you’ll love it too. I decided on a cold brew infusion because it’s naturally less acidic than hot and would recommend this method for fermentation. Cold brew does release more caffeine than hot though, so if preferred you can use decaf beans. Perhaps surprisingly, coffee kombucha does not taste acidic. It’s slightly tangy, incredibly smooth and has a mild effervescence on the tongue which works really well. I did a secondary ferment with a vanilla-cinnamon simple syrup . . . oh my, so SO good. Boil 2 cups of water in a small pot, add sugar and stir to dissolve. Allow to cool to room temperature. Add coffee, sweetened water and remaining water to a large jar or French press. Stir well to immerse the coffee and then cover with a clean cloth or the top of the French press (without plunging it). Allow to infuse at room temperature for about 12 hours. For French press, simply plunge. For large jar, strain through several layers of cheesecloth and a fine-mesh sieve or use a nut milk bag or pantyhose. Transfer strained coffee to a glass brewing vessel (a large mason jar or water jug work well). Cover with a clean cloth and secure with a rubber band. Allow to ferment for 4-12 days. Depending on the temperature of your home, this will take more or less time. I recommend tasting on day 3 and every day after until you reach the flavour you like. There’s no right or wrong here, stop it when you like the taste. You’re looking for the sugars to be reduced and for there to be a slight tanginess and carbonation on the tongue. Once fermented to your liking, you can transfer to bottles and store in the fridge until you’re ready to drink or you can move on to a secondary ferment to add flavour. I’d highly recommend this step! 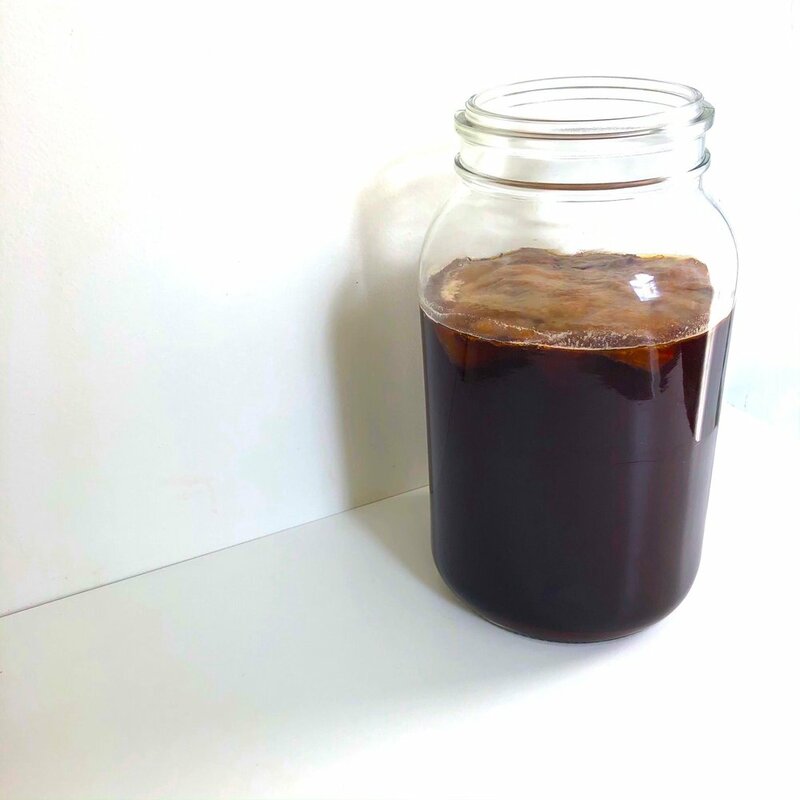 Store your coffee SCOBY in enough brewed coffee kombucha to keep it submerged. I store extra SCOBYs in brewed kombucha, covering with a clean napkin and securing with a rubber band at room temperature. You can keep multiple SCOBYs in the same jar and feed them a little sweetened tea or coffee every 6 weeks or so until you’re ready to brew with them again. Boil water in a small pan, then add sugar and stir to dissolve. Reduce the heat and add cinnamon stick. Simmer for 5-7 minutes then remove from heat and allow to cool. Once cooled, remove cinnamon stick and stir in vanilla. To double ferment your coffee kombucha, use 1 Tbsp of vanilla-cinnamon syrup per 500ml of kombucha. Remove SCOBY and enough kombucha to cover it and reserve this for your next bulk ferment. Add syrup to glass bottles and then pour in kombucha to the top of the bottle. Seal tightly to keep in carbonation. Allow to ferment for 1-4 days. Please be mindful that you are building pressure inside the bottle. After 1 day, open one of the bottles to check carbonation levels. Once you have fizz, all of the bottles should be transferred to the fridge for storage until you’re ready to drink to slow fermentation down. 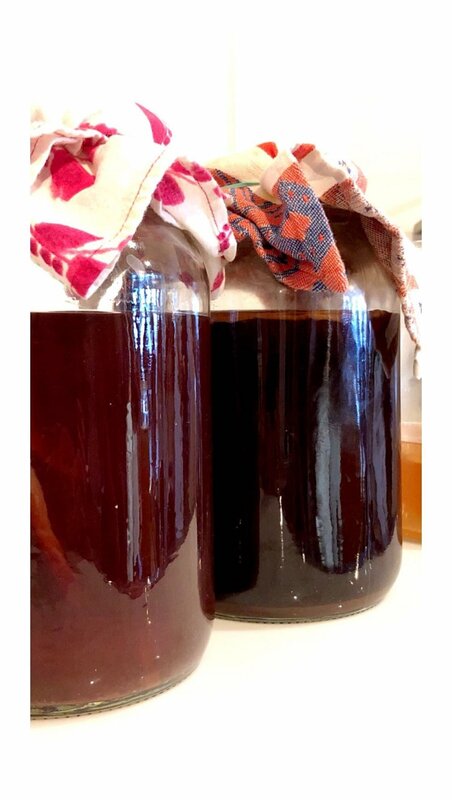 Brewed kombucha will keep in the fridge for several weeks, extra vanilla-cinnamon syrup will keep for 2 weeks. Enjoy!! If you have any questions, let me know in the comments below.